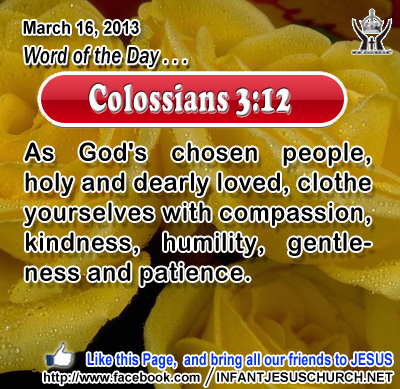 Colossians 3:12: As God's chosen people, holy and dearly loved, clothe yourselves with compassion, kindness, humility, gentleness and patience. Heavenly Father, thank you for bringing us into your family. May we never disappoint you in the way we treat others. May they see in us, the qualities of character that can only be attributed to your presence in our life. To you be the glory and the honor, forever and ever, in the name of Infant Jesus. Amen. 40When they heard these words, some of the people said, "This is really the prophet." 41Others said, "This is the Christ." But some said, "Is the Christ to come from Galilee? 42Has not the scripture said that the Christ is descended from David, and comes from Bethlehem, the village where David was?" 43So there was a division among the people over him. 44Some of them wanted to arrest him, but no one laid hands on him. 45The officers then went back to the chief priests and Pharisees, who said to them, "Why did you not bring him?" 46The officers answered, "No man ever spoke like this man!" 47The Pharisees answered them, "Are you led astray, you also? 48Have any of the authorities or of the Pharisees believed in him? 49But this crowd, who do not know the law, are accursed." 50 Nicode'mus, who had gone to him before, and who was one of them, said to them, 51"Does our law judge a man without first giving him a hearing and learning what he does?" 52They replied, "Are you from Galilee too? Search and you will see that no prophet is to rise from Galilee." 53 They went each to his own house. Are you ready to give Jesus our full allegiance? And who is Jesus for each one of us? There will often come a time when we have to take a position for Jesus and for the gospel. To stand for Jesus may provoke mockery or disrespect. It may even involve hardship, sacrifice, and suffering. There are fundamentally two choices we must choose between: to have our lives fueled by God’s unselfish love for others or by our own self-centered love and selfish desires, to be loyal to God’s wise rule and kingdom laws or to the standards of a worldly kingdom opposite to God, to be servants of Jesus our Master or slaves of sin and Satan. Are we ready to stand for Jesus and to show him honor and loyalty whatever it may cost us? Loving Infant Jesus, your Gospel brings joy and freedom. May we be loyal to you always, even though it produce a cross on earth, that we may share in your crown in eternity.